Over the last few months, some of our friends in the Blogosphere have kindly nominated us for blogging awards. This thank you is well overdue, but we’d like to take this opportunity to show our gratitude to Snail of Happiness, who nominated us for a Super Sweet Blogger Award, Aneela of The Odd Pantry, who nominated us for a Liebster Award, and Transplanted Cook, whose Sunshine Award also brightened our day! Do take a moment to look through their blogs: they are well worth a visit! Tori Avey’s beautifully produced blog is full of fascinating articles on how we came to eat the dishes we enjoy today. 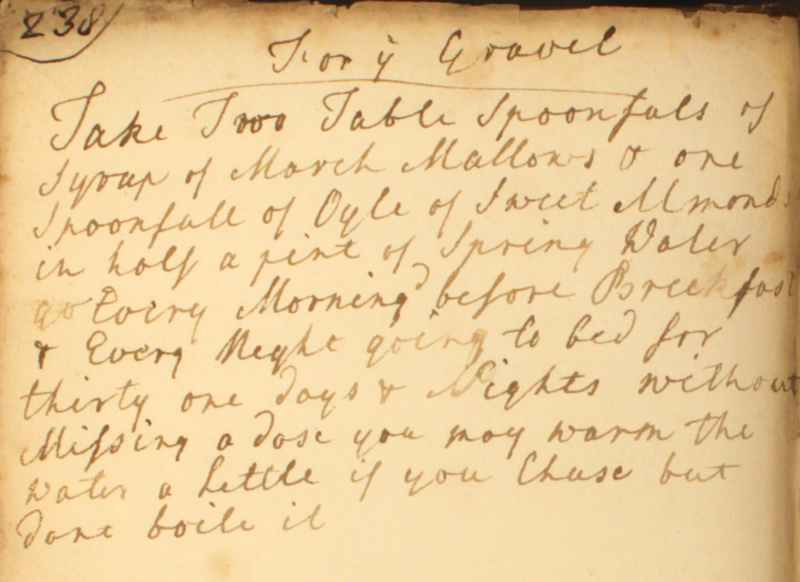 Tori has also put together collections of ‘vintage’ and ‘literary’ recipes to try at home. We particularly like the sound of the ‘Smoking Bishop’ drink, a hot spiced punch drink mentioned in Charles Dickens’s A Christmas Carol! Sydney Living Museums are behind this fantastic site, bringing together cook Jacqui Newling and curator Scott Hill in an exciting collaboration to explore the way we ate and lived in times gone by. 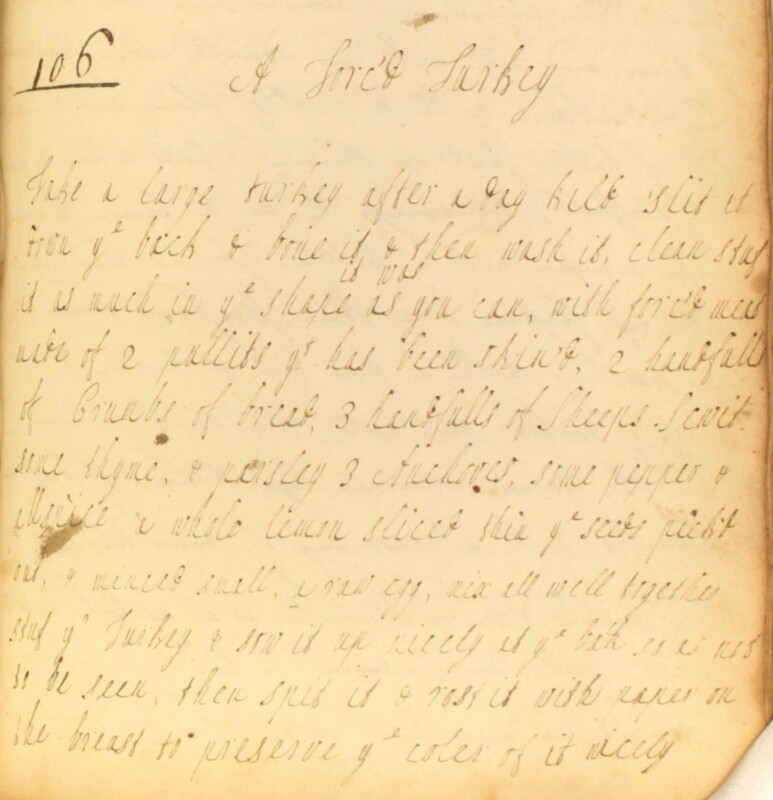 There are lots of historic recipes to try, but we also recommend taking a look at their articles on he development of dining conventions and the ‘lost arts’ of cookery. A great insight into the way our ancestors lived and ate. The Cookbook of Unknown Ladies featured on this site some months ago… National Public Radio’s food blog ‘The Salt’ brings you the latest news in gastronomy, including some intriguing discoveries and investigations into our food traditions. From the Roman roots of fish sauce to why we colour cheeses, it’s a really eye-opener! Keep up-to-date with the latest exhibitions and publications on 18th century history with the Enfilade blog. Well worth subscribing to! This blog exudes enthusiasm, and it is infectious! Just as good for exploring the recipes of Jane Austen’s day as it is for raising awareness of lost dishes from the more recent past. The blog is beautifully illustrated with photographs, showing the principal steps of each recipe. 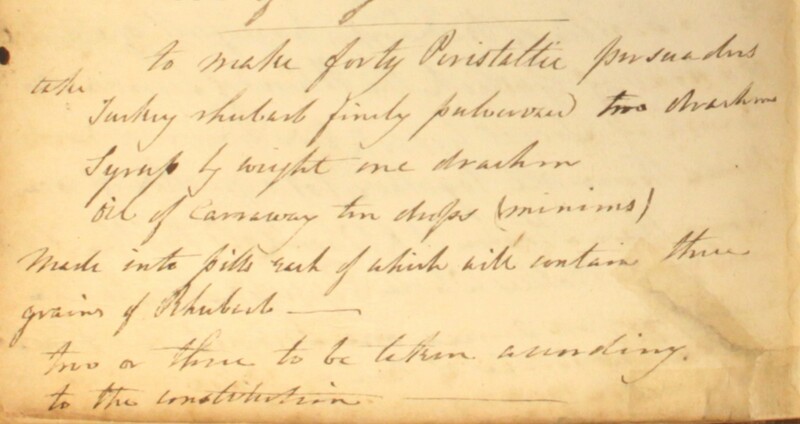 A roast turkey dinner, 18th century style! This spit-roasted bird is stuffed with a tasty chicken forcemeat and served up with a rich white wine gravy, flavoured with anchovies, oysters, celery, mushrooms, artichokes and mace. Take a large turkey. After a day kild, slit it down ye back, & bone it & then wash it. 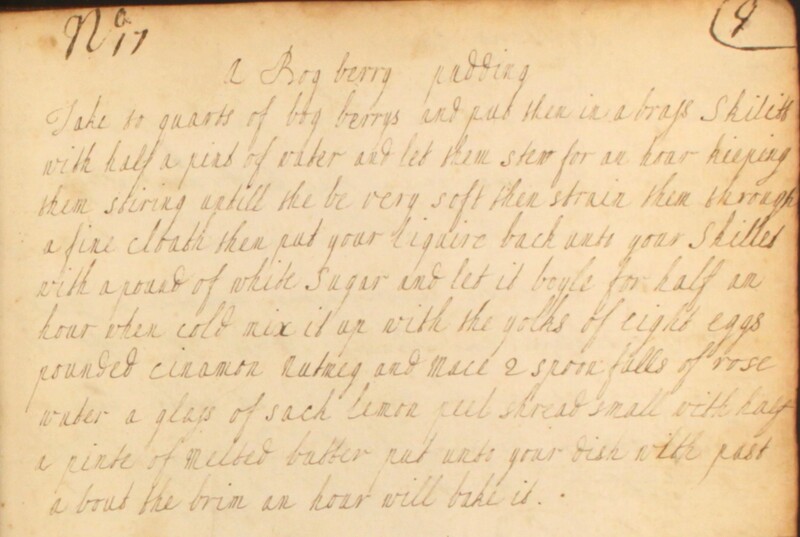 Clean stuf it as much in ye shape it was as you can with forc’d meat made of 2 pullits yt has been skin’d, 2 handfulls of crumbs of bread, 3 handfulls of sheeps sewit, some thyme, & parsley, 3 anchoves, some pepper & allspice, a whole lemon sliced thin, ye seeds pick’d out & minced small, a raw egg. Mix all well together stuf yr turkey & sow it up nicely at ye back so as not to be seen. Then spit it & rost it with paper on the breast to preserve ye coler of it nicely. 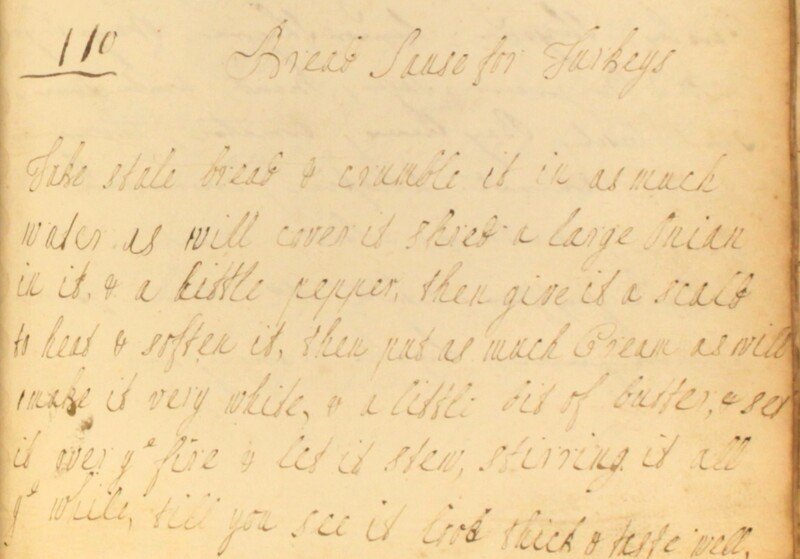 Then have a sauce made of strong greavy, white wine, anchoves, oysters, mushrooms slic’d, salary first boyl’d a littile, some harticholk bottoms, some blades of mace, a lump of butter roll’d in flower. Toss up all together & put ym in yr dish. Don’t pour any over ye turkey least you spoyl ye coler. Put ye gisard & liver in ye wings. Put sliced lemon & forc’d balls for garnish. Take your sallary and cut it small. Then boyle it tender in fair water. Then take it and stew it in fresh cream and a little nutmeg. And when it is so stewd, put in a little white wine and gravy and melted butter as you think proper, and so serve it up. Are dressed as carrots but neither scraped nor cut till after they are boiled. They will take from an hour & half to three hours in boiling. Send to table with salt fish, boiled beef &c.
The potatoes must be free from speck[s] and white. Put them on in cold water. When they begin to crack, strain them and put them in a clean stewpan by the side of the fire till they are quite dry and fall to pieces. Rub them thro’ a wire sieve on the dish they are to be sent up in, and do not disturb them.